The Miami Dolphins' stunning walkoff touchdown will rightfully dominate the discussion surrounding their 34-33 win over the New England Patriots on Sunday. It's rightfully being coined as the Miami Miracle. But that's just what that play was. A miracle. And if not for that play - which culminated with a hobbled Rob Gronkowski getting caught out of position as Kenyan Drake raced to the end zone - the discussion would instead focus on ... well, the defense wasn't good anyway. But there would be a lot of talk about Gronkowski's resurgence on offense - and by extension, the whole group. Tom Brady had perhaps his best game of the season, too. 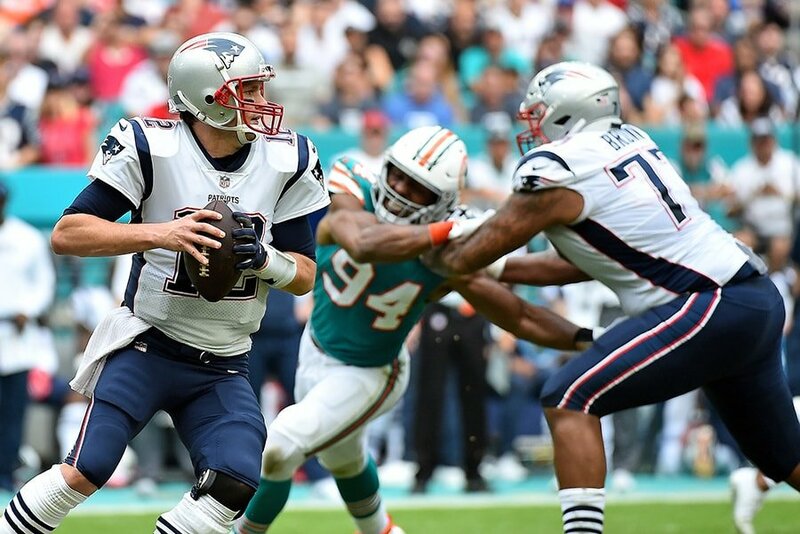 Often working with a clean pocket and a depleted Dolphins secondary, Brady picked Miami apart for most of the time he spent on the partially mangled field at Hard Rock Stadium. He finished 27-of-43 passing for 358 yards, three touchdowns and no interceptions for a strong 112.5 passer rating. He also continued the trend of protecting the football after a sloppier first half of the season; the offense collectively has turned the ball over just once in the last six games. But it was even better just when Brady was targeting Gronkowski. The tight end caught all eight targets for 107 yards and a touchdown - resulting in a perfect 158.3 rating for No. 12. It wasn't all smoke & mirrors, either. While you can tell that Gronkowski still doesn't look like he can get the same separation we're used to seeing, he straight-up beat the coverage on most of his catches. He got behind Kiko Alonso on his second catch of the day, a 15-yard conversion on third-and-7. He stood tall and leapt up near the goal line for a 13-yard catch that nearly got him what would've been his second touchdown of the day. After an ending like Sunday's, it's understandably hard for Gronkowski to extract the positives. "Yeah, I mean, that's good enough; but it just shows what happens when you lose," said Gronkowski. "You can have a great game, whatever, but if you don't get the W, it really doesn't matter. We’ve just got to always find ways to do more and just be ready to play 60 minutes of football every single time you step on the field." Oh, and about the touchdown ... Gronkowski also finally delivered in the red zone, making his first (!) catch all season from inside the 20-yard line with a 16-yard score. Granted a free release off the line, Gronk roamed to a soft area of the field as cornerback Bobby McCain didn't get back on him, reeling in the Brady touch-pass with relative ease. He broke away from Dolphins defensive end Andre Branch for an 11-yard pickup in the third quarter. He broke off a block well enough to find another opening in the zone and reel in an easy 16-yarder. Just about all of Gronk's production came against zone defenses. Fine, let's see how he does against more aggressive man-to-man coverage. But it's at least an encouraging sign that, if someone chooses to play zone against Brady, he and Gronk can still take what said defense is giving them. The Steelers have a history of playing such a way against Gronkowski, so there's a chance that his resurgence continues for at least another week. Unfortunately, the offense also made a big mistake of its own that tends to overshadow a great overall day. Brady made maybe the single dumbest mistake of his career as he pulled a Chris Webber, attempting to call a timeout at the end of the second quarter when the Patriots had none. Taking a sack with no timeouts, and leaving all possible points on the field in that spot, is the kind of mental implosion that you see out of the league's most spectacular boneheads. "Un-Brady-like" doesn't even begin to describe his blunder. "That was a terrible play by me," Brady said after the game. "That should never happen. I lost track. I thought we had one time out. We called the one, and we ran a couple plays, and I was just not thinking on third down. So it was just a play that should never happen." Welp, it usually does never happen with Brady. It's hard to believe it happened, but it's even harder to believe that it's the start of anything new for the quarterback. Like the miracle final play, Brady's gaffe is a fluke-y kind of one-off thing. The play of the offense for about 59 minutes in this game was the thing that could be the start of a trend. 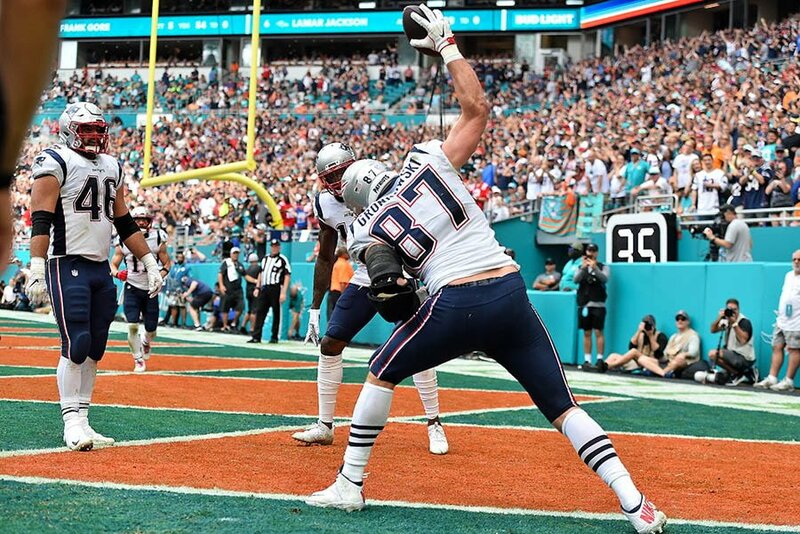 If the Patriots can just go ahead and avoid historically bad mistakes, and Brady & Gronk can continue to connect like they did in Miami, then maybe the unit can finally turn the proverbial corner.